Melissa Huitema says there have been confrontations with neighbours over the parade of care staff who park by the family's home. The mother of a terminally ill Calgary boy who requires around-the-clock care says she is being hassled by neighbours over street parking. Street parking is a "free for all," she said. No one has driveways and garages are in the laneway. "I've had people come to my door and tell me that I needed to move the vehicle or they were going to hit it. I've had people leave notes on the vehicle asking not to park here, park there. I've had people saying 'Can you not park in front of my house?' when I'm walking out with my kids," she said. "I'm trying to deal with other things. There's kind of a lot going on." She said many of those complaining are aware of Cade's condition. The Calgary Parking Authority says it doesn't comment on specific cases, but says the street space in front of residential homes is public. The family has a wheelchair accessible spot in front of the house, but it's open to anyone with a permit and is sometimes taken up. Huitema declined to say in which neighbourhood she lives. She said she doesn't want to call out her neighbours or worsen tensions with them. "We need to be more aware of what people are going through," she said. "You need to take a step back and think about your actions." Cade, her middle son, has Krabbe disease which affects the nervous system. Set to turn six in November, he has lived well past the typical life expectancy of two. 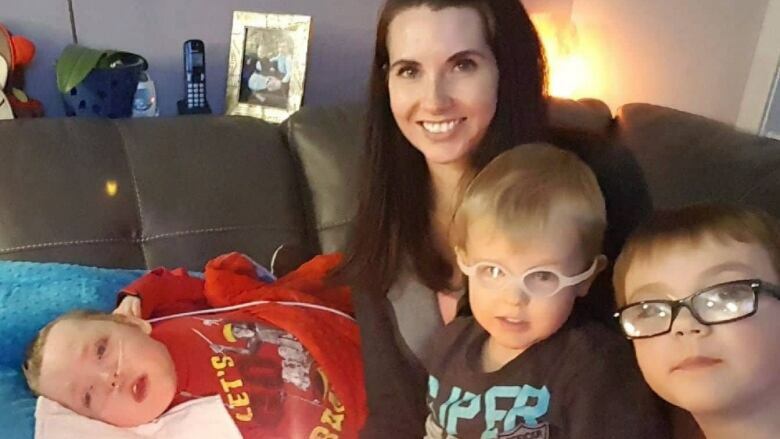 "Cade is completely aware of what's going on around him, but his body is failing him," said Huitema, who is a registered nurse. "They've taught him how to communicate. He looks to his right for yes, his left for no," said Huitema. "He makes decisions on his own. He picks his books. The nurses even let him pick out what he wants to wear for the day." Lakha-Evin's 29-year-old daughter, who has severe cerebral palsy, lives with her and there are constantly caregivers in her home. "Everyone in my area is very aware of the copious comings and goings of people and it's never been an issue," she said. She knows of some cases where a family has circulated a note to neighbours explaining why there are so many visitors. She said it's not up to the city to step in when there's a conflict.